Attaboy! Paying taxes is for suckers. 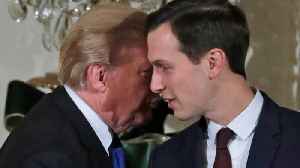 Senior White House advisor and Donald Trump’s son-in-law Jared Kushner likely paid little to no income tax between 2009 and 2016, The New York Times reported on October 13. Kushner, whose net worth has soared to almost $324 million during the last decade, “appears to have paid almost no federal income taxes,” according to confidential financial documents reviewed by The Times. “The White House last year championed a sweeping revision of the nation’s tax laws that expanded many of the benefits enjoyed by real estate investors, allowing them to reap even larger deductions,” The Times noted. The report was based on more than 40 pages of documents that The Times reviewed, which were created with Kushner’s cooperation as party of a review of his finances when applying for a loan. The White House refused comment for the story.